360 Degree Feedback is a system in which employees receive open, anonymous feedback from the people who work around them. 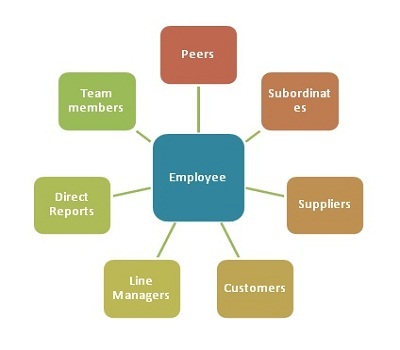 This typically includes the employee's manager, peers, direct report and in some cases external people as well. A mixture of people will fill out an anonymous or explicit online feedback form that comes with questions covering a broad range of workplace competencies & personal development topics. The feedback forms include questions that are measured on a rating scale and also ask raters to provide written comments. Managers and leaders within organizations use 360 feedback surveys to get a better understanding of their strengths and weaknesses. The 360 feedback system automatically tabulates the results and presents in a format that helps the feedback recipient create a development plan. Individual responses are always combined with responses from other people in the same rater category (e.g. peer, direct report) in order to preserve anonymity and to give the employee a clear picture of his/her greatest overall strengths and weaknesses. 360 Feedback can also be a useful development tool for people who are not in a management role. Strictly speaking, a "non-manager" 360 assessment is not measuring feedback from 360 degrees since there are no direct reports, but the same principles still apply. 360 Feedback for non-managers is useful to help people be more effective in their current roles, and also to help them understand what areas they should focus on if they want to move into a management role. Following the same process mentioned above we developed a 360 degree feedback system. Which helps employees to analyses their performance and can use it for their performance appraisal, that will help both the company and the employee to "improve their performances" and to find the areas where they hold advantage and disadvantages. Copyright © 2017 Powered by Fego.